$8:00 or donation, entrance by stairs at Houdini’s, on Decatur St.
A rare performance back in NYC of Early Web – the duo of Anastasia Clarke and Chris Penalosa. Anastasia is an Oakland/NYC based composer and performer, using tabletop electronics and software and hardware instruments of her own design. Chris Penalosa, based in NYC, uses modular electronics. He works with the Generations Unlimited record label. With Live video projection by Katherine Liberovskaya. A rare duet by two old friends :Mike Bullock and Seth Cluett are sound makers with 20 years of collaboration behind them. 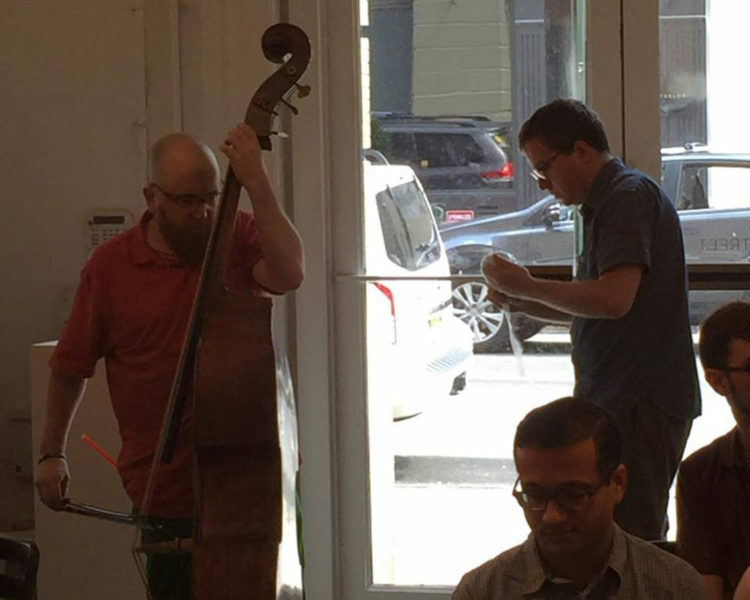 With idiosyncratic individual practices and a strong inclination to improvise, they check in with one another periodically to see what they sound like together. They have been practicing in an anechoic chamber to unearth strange new acoustic relationships. Mike will play an acoustic bass, and Seth will play an amplified zither. Each player’s sound is fed into the body of the others’ instrument through tactile transducers and as you might expect, there is some feedback. Their brains are connected through the ether and the results are surprising even to them. The definition of rare. A solo performance by percussionist and explorer Sean Meehan.